Just because you’re in what seems like a small niche with your blog doesn’t mean you can’t make a lot of money or turn that into a full-time business. In fact, many of the blogs and businesses you follow probably make 6 figures annually and have been built around very small niches. Take my niche for instance. Since you’re likely a blogger, it may seem like stock photography is a big niche. There are a lot of options to choose from – right? Truthfully.. it’s not that big. 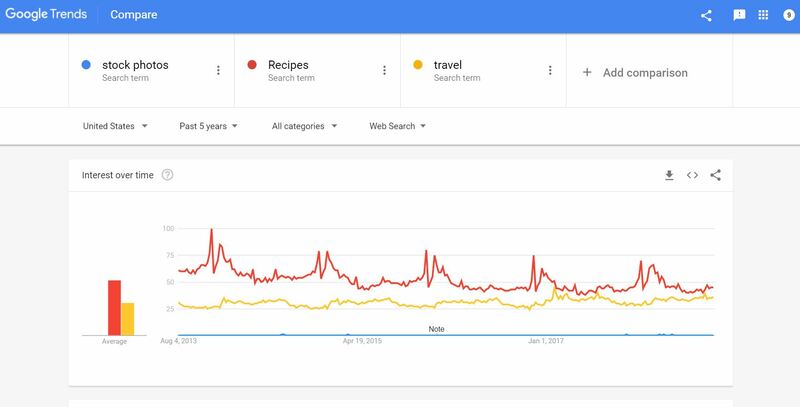 If you do a comparison with other “GENERAL” niches on Google Trends, you’ll see that mine is quite small. Terribly small in comparison of the number of searches the topic gets. Just the general term “Stock Photos” is only a tiny blue line and blip at the very bottom of the chart!! Keep in mind that I didn’t type in ‘feminine stock photos’ or ‘entrepreneur stock photos’ either which would narrow the results even greater. But even though the topic doesn’t get searched for as much as some more popular general topics, I have still managed to build a 6 figure business of my own and I don’t charge the most in my niche either. Some might say I charge the least with an annual membership for less than $100. But, that’s my business model.. The reality is, I offer a quality and affordable product that’s in demand and in with a variety of options. I give my audience free services and provide multiple options for them to engage with me to try my services and products out. I have continued to do that and have diversified my streams of income from the very beginning and have kept at it. I haven’t changed course and I’ve stayed consistent with my business model. Most new blogs don’t last that long and that goes for affiliate or product/service websites too. So, if you can manage to pick something you love and would do even if there were no money involved, then you’ll already be more reliable and consistent in your niche than most, which builds trust with your audience. I’ve detailed the blogging business model that makes me a full-time income and another post here on exactly how I make an average $10,000 a month with my blog. So, knowing that it’s possible with consistency, I bet you’re dying to know the exact steps for how you can take your very small niche (no matter how tiny) and build a profitable business that thrives too? Well, here are my 3 essential steps. Get a notebook out and start jotting down the first things that come time mind as you’re reading too. Those first ideas will continue to inspire new ones and remind you to keep going. Make it your home page’s primary and only goal: to get your visitors on an email list. Aim for a starting conversion rate of at least 15%. The higher the better! Want to know the exact steps for starting? I put together the steps for getting your first 1000 email subscribers right here. Email the people on your list regularly and build a relationship with them. Demonstrate that you know what you’re talking about by giving them great advice, consistently. I cannot stress enough how building an email list will change your business but just incase you need more convincing with real-life proof, you should see some of the stats and how I can make $1k in a day with my email list alone. Successful marketers and bloggers know that the money is made on the back end, not the front end. If you’re in a small niche, however, sometimes it can be very difficult to come up with back-end products. “What product can I create for XYZ niche? !” I can’t count how many times I’ve seen this question pop up time and time again in our facebook group because it happens all the time. If you’re having a tough time thinking of a product, why not try coming up with different ways of presenting the same information your offer on your blog as your first product? Turn it into a presentation, an eBook, or an online course. Expand with a few videos and people will gladly pay to have a single self-paced source of information. You could also do some sort of group coaching calls or individual coaching calls that you charge for as your first product. Then, record the sessions and turn those into a product that is evergreen. If your initial product is a digital eBook, consider creating or expanding that into a self-paced online course. The perceived value is a lot higher because online courses usually come with extras like workbooks, videos, and group activities (like Facebook Groups or Monthly Group training). If you can work a high ticket item into the mix, such as an exclusive workshop you only offer once or twice a year, you have an even greater chance of making a lot of money – even in your very small niche. In a small niche, most of the high profile teachers and marketers will know one another. If there are big players in your industry that you don’t know yet, make an effort to connect with them. If they’ve already heard of you, often all it takes is a phone call. 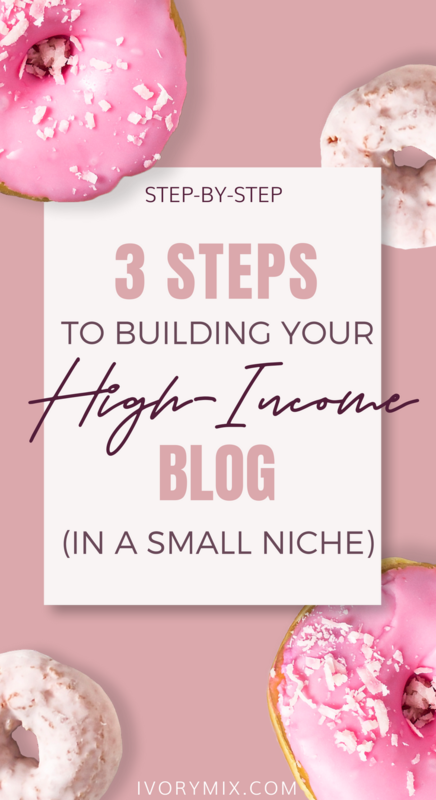 Partnering with other business owners or bloggers in your industry is just one example of a very powerful way to take advantage of the smallness of your niche. Do products together. Do group interviews. Teach a workshop together. Create a video summit where every person you know in or around your niche participates and then don’t forget the important step of charging for it. You could probably even create an upgrade that costs even more. It’s been said that the difference between experienced entrepreneurs and the ones who are just starting out is that the experienced think with “one more zero.” If you’re new to the concept of building your own business, you may ask yourself “how they I make $2,000 a month?” while successful and long-running entrepreneurs ask themselves how they can make $20,000 a month. So, remember the 3 steps =>start by building a highly responsive email list, then develop a product line with a wide range of price points. Finally, find others in your industry that you can partner with to increase your earnings even more.